Taken against a backdrop of the available European Textile Market (EMEA) value for Printed Textiles, the growth rate numbers provide a fascinating picture of opportunity for the Digital Textile Printing Community, the facts speak for themselves, predicted growth rates for Non-Signage Textiles are shown below. The opportunities abound, and from entry level manufacturers to many large scale operations, a Digital Printing Agenda, is a must for every decision maker, and with double digit growth predicted, no-one can afford to ignore the facts. 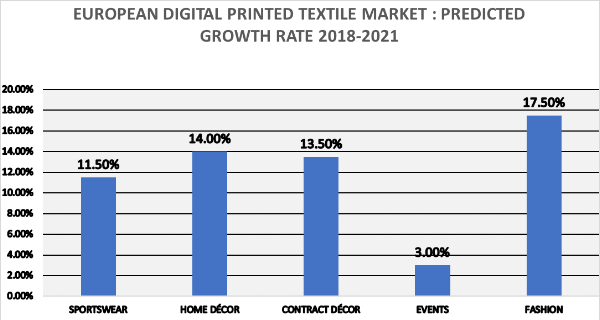 It is reliably estimated that the total value of all Printed Textile products in Europe for 2018 was in excess of $2.3 billion, of which just over $320 million was produced by Digital Textile Printing. This represents a huge opportunity for the Digital Print Community, as ink and machine prices tumble, with print speeds and quality increasing at an astonishing rate. These factors account for the growth potential which, as shown above, predicts a diverse future for the sectors. The reason for this diversity is relatively simple, in that, the Market Penetration of each of the five sectors varies according to the amount that Digital Printing has been successful in each sector. This reflects the nature of the Events/Soft Signage Market, which was already well established, using Vinyl, Rigid Substrates and Papers. 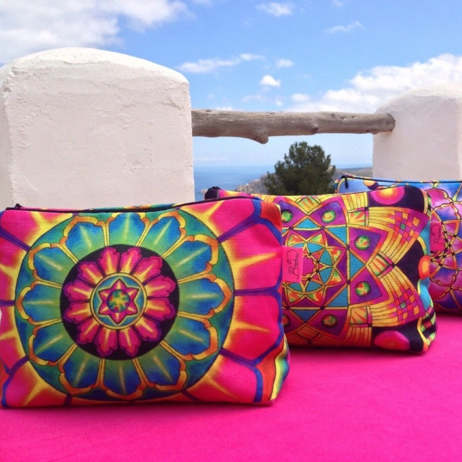 In this market the transition to Textile printing did not prove onerous. All the technical skills were there, knowledge of Workflow and RIPs was commonplace and, above all, Textiles provided a new and exciting agenda for Events and Soft Signage based on cost, quality and performance. Over the last ten years, Digital Printing has come to dominate the Events and Soft Signage market. Yet it is now a mature market place, well served by Suppliers and Manufacturers, and the prospects for growth are low, as reflected in the above chart. The other four sectors, by comparison, had further to travel, and it has taken some time for the Supplier base to offer viable solutions. Sportswear needed Software and Workflow that cut time and costs. Home and Contract Décor needed certainty of both regulatory and performance standards. Fashion needed the broadest possible range of fabric possibilities as well as bespoke Software and Workflow, to make the transition to Digital Print feasible. Most of these yardsticks have now been achieved. Nesting Software, Colour Management and Augmented Reality have moved the workflow scene towards Digital. Advances in speed and the reduction in costs of Printing Machinery have encouraged new entrants in all Sectors. The Sustainability agenda, focussing on Digital Textile Printing’s ability to consume less of the Earth’s scarce resources than it’s Screen alternatives, has made Digital a favourite son of the environmental lobby. Improvements in Ink Formulations and Chemistry, as well as an increased supply of Technical Fabrics have removed any doubts that Digital Printing can achieve the highest regulatory and performance standards. So the opportunities abound, and from entry level manufacturers to many large scale operations, a Digital Printing Agenda, is a must for every decision maker, and with double digit growth predicted , no-one can afford to ignore the facts.